Dina Meri R10-MT KD Nail Table Cabinet is a replacement cabinet for these nail tables. CHA CHA, BOLERO AND MAMBO. 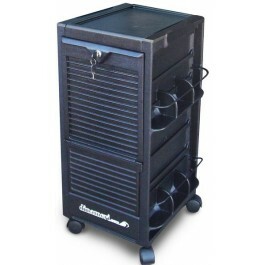 Comes 4 assorted trays, "Flip N Fold" lockable door can be left open to access trays or folded away, Tween Hooded casters for easy mobility. Dimensions: 16"D x 14"W x 29"h Weight: 12 lbs. ***PLEASE SPECIFY IF YOU PREFER "RIGHT ENDED" (side pockets are on the right side) or "LEFT ENDED" (side pockets are on the left side) or if you have a double table you may want to purchase one right and one left.